Should I Sell, Make Improvement, Finish Basement, Move or Remodel. How much do I get for a finished basement. How much do I get for granite. IS IT TIME TO REMODEL … OR BUY A NEW HOUSE? Have you been pondering whether or not to remodel your kitchen or bathroom? Does there just not seem to be enough space? Are your things constantly getting cluttered? Many homeowners are facing similar issues and are starting to pose the question to themselves, "Is it time to remodel or buy a new house?" Interestingly, in today’s market, thanks in large part to the market correction we’ve seen over the last few years, many homeowners are comparing the high costs of remodeling with the opportunities in the move-up real estate market and are realizing that it may make better sense to move rather than remodel. We recently came across this article on MSNMoney.com, written by Liz Pulliam Weston, which poses the question, "Is it time to remodel…or buy a new house?" and we wanted to share a few excerpts with you. We feel it gives an accurate portrayal of the pros and cons associated with remodeling and moving and may give you some food for thought in making your own real estate decisions. "When his clients ask whether they should remodel their homes, financial planner Phillip Cook of Torrance, California likes to recount the night he and his wife spent trying to keep El Nino rains from flooding their partially renovated home. "All these tarps over the construction came loose, and we were up there trying to pound nails at 3 a.m. to keep them from blowing away," Cook said. "My poor wife. And the neighbors…"
That wasn’t the only nightmare the Cooks faced in the year-long transformation of a 900-square foot beach bungalow into a 2,600-square foot home. The ongoing hassles, the unexpected expenses, the now-you-see-them-now-you-don’t workmen – all have left Cook with little question about whether remodeling or moving is better. "It’s like asking if you should poke yourself in the eye or go on a cruise," Cook said. While he likes the end result, "I wouldn’t do it again." There are, of course, plenty of people who are happy with their renovations, and remodeling is certainly a thriving business. For many people, though, moving is the simpler, less expensive and certainly less stressful option. How ‘necessary’ is this project? That’s easy to forget when you’re drooling over the neighbor’s newly-redone kitchen or tripping over your kids’ toys in what feels like an incredibly shrinking house. But generations of families have lived in homes that are probably a lot smaller than and perhaps not as nice as yours. • Declutter. Getting rid of excess stuff and organizing what’s left can transform your space, said designer Nancy Geoghegan, without the expense of a move or remodel. "Once they clean out and clear up, they discover they have more space than they thought they did," said Geoghegan, whose Fort Lauderdale company One Day Decor specializes in helping clients redesign their homes using their existing stuff. "Everything takes on a completely different feel." • Refurbish instead. 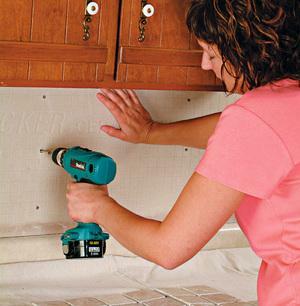 Kitchens, for example, can be updated by refacing cabinets, resurfacing countertops and replacing worn flooring. That’s going to be a whole lot cheaper than ripping out all the cabinetry and starting over. • Repurpose rooms. Never use that formal dining room, but need a home office? Rather than build or buy, consider reusing the space you’ve got. Getting a handle on costs may be one of the toughest parts of any move vs. remodel decision, largely because renovations can be hard to predict. Once you tear into a wall or start excavating, who knows what you’ll find. An architect can help give you a ballpark on a remodel, and she may even point out some ways to save money. But for the real scoop, you’ll need to get detailed quotes from a few contractors or builders who do work of the same type and quality that you want. You need to talk to someone who buys materials and bids projects every day, said builder Stephen Lane, to get an accurate price picture. "I quoted a plan for a customer some years ago where the architect told them the cost would be about $100 per square foot," said Lane, owner of Lane Custom Homes in St. Charles, Ill. "I left the meeting with the wife crying and the husband doing his best to keep the ‘dream home’ alive as I was (the cheapest of three bidders) at $132 per square foot." • The out-of-pocket costs of construction (any savings or other funds you plan to devote to the cause). • The cost of any financing (usually your monthly payments multiplied by the time you plan to remain in the house). • If you’re adding on rather than renovating, the cost of higher utility bills, bigger homeowner’s insurance premiums and greater property taxes from your additional space. • Real estate commissions, closing costs and moving, which typically equal 10% or more of the house you’re selling. • The cost of the new, presumably bigger mortgage, multiplied by however long you plan to be in the house. • The cost of higher utility bills, bigger homeowner’s insurance premiums and greater property taxes over the same period. • Any new furniture, window treatments, landscaping or other fix-up changes over the years. Because home renovations are a luxury, they need to be considered only after you’ve taken care of the basics. You should be saving adequately for retirement, be free of credit card debt and have a nice fat emergency fund. If your finances aren’t absolutely rock solid and you really can’t put off the move or remodel decision, Cook recommends moving. "Remodels always cost more than expected, versus a purchase price, which is fairly well known," particularly for buyers who get a good home inspection before they purchase, Cook said. "Obviously, you may run into some unexpected costs, but they won’t be on the same scale as a remodel." As you can see, there are definitely pros and cons to both but what I can tell you is that in today’s market, we are seeing an increasing number of homeowners opt to move rather than remodel. Many are finding that when they go to purchase their new home, they are enjoying a buyer’s market and homes that are generously discounted from years passed. Of course it is important to note that each person’s circumstances are different so if you are pondering the question, "Should I remodel or buy a new house?" please give me a call and I’d be happy to sit down and discuss your options with you.